The advanced destroyer is capable of tracking the aerial, surface and sub-surface targets simultaneously. Iran’s domestically-made destroyer, dubbed Damavand, officially joined the Navy’s northern fleet in the Caspian Sea on Monday. The homegrown vessel, an advanced destroyer, was officially delivered to the naval forces stationed in fourth naval zone, north of the country. A number of ranking officials, including Secretary of Iran’s Supreme National Security Council (SNSC) Ali Shamkhani, Defense Minister Brigadier General Hossein Dehghan and Navy Commander Rear Admiral Habibollah Sayyari attended the ceremony in the port city of Bandar-e-Anzali. 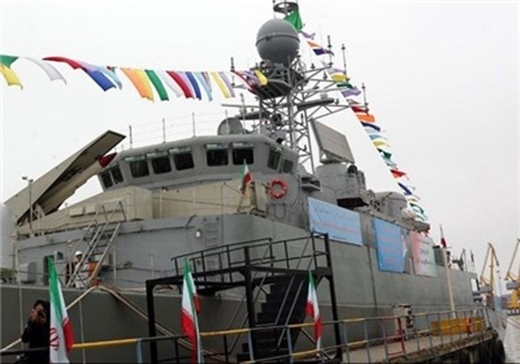 More than 700 industrial, research and academic Iranian centers have cooperated in designing and producing the military vessel, which is also a training warship. Experts at Iran’s Defense Ministry have installed 25 homegrown electronics and communication systems on Damavand, including advanced naval radars and systems for communication, detection and interception. Damavand is a Jamaran-class destroyer with unique features to meet the demands of the Iranian naval forces in the country’s northern waters.